I was never a big Lord Have Mercy fan, to me he was always a hype man for a rapper who didn't need a hype man. But when this bootleg 12" came out in 1998/99 I was a major M.O.P. and I still am to this day so I had to pick this because of the fact that it co stars lil' Fame and Billy Danzene. This bootleg was picked up in Uptown records in London's west end for about £8. It is produced by Nottz and it was originally recorded for Lord Have Mercy solo album﻿ 'Thee ungoldy hour', but that album never came out. However a track as dope as this rarely gets left on the cutting room floor and finally made it onto M.O.P. 's 2000 classic 'Warriorz'. Home Sweet Home could almost be a Premier, joint like the majority of the 'Warriorz' album was, but its Nottz who created this funky joint. Its made up of some nice horns as well as an off kilter piano loop with some humorous lines from Lord Have Mercy and those Brownsville boys. Of course Billy and Lil' Fame drop some of those signature gun sounds effects that we all love. I really like this joint its got a dope beat from a producer who almost always drops heat and three hyped up emcees. The B side is a funky track called 'Paint ya Face' and is produced by Nottz again. The beat is a solid beat with some nice bongos and what sounds like a native american chant running through it with a nice bassline underneath it. Lord Have Mercy tells us all to paint our faces for some reason that I am unsure off. He also tells us that he dances like Indians, maybe he thinks that if he does the correct dance Busta will allow him to release his album although this strategy clearly didn't work back in 1999. As far as I know 'Thee Ungodly hour'r was scrapped when Lord left Flipmode. Also set for the album was Havoc. Lord left Flipmode stating that he did not like the mainstream direction Flipmode was taking and also stating that Busta Rhymes had promised that Flipmode would be a launching pad for all of the members solo careers, which for Lord Have Mercy did not happen. He also blamed Busta for holding his record release back and relegating him to being a "backup singer. Fellow former Flipmode member Rah Digga, indirectly corroborated this when mentioning in an interview that Busta shelved Lord's album release (which was completed) for Digga's (which hadn't even started although it did end up containing tracks by both Premier and Pete Rock). 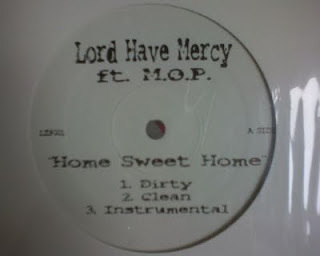 After leaving Flipmode, Lord recorded a three song single called The Come On Down EP which included songs "Charge", "We Will", and "Come On Down". Lord disappeared from the scene for a while before forming his own record label Sword and Shield and releasing the mixtape The Runaway Slave. The mixtape had many strong hits like "Until the Wheelz Fall Off", which is still available on iTunes in the US at least. Thanks Mort, coming with the dteails as usual. A very rare bootleg. It actually is the only recording containing the instrumental version of Home Sweet Home, very sought-after. Nottz sample Mexicali Brass - Kisses Sweeter Than Wine quite simply but very effectively on this one. For my man Dredwerkz I'm re upping that Lord have Mercy 12" tonight.